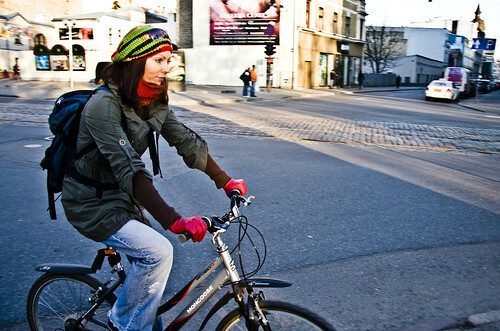 A little bit more Cycle Chic from Riga. As it was explained to me by a local, mountain bikes are popular in the Latvian capital. Well, not popular, but toleratd since it's hard to get a normal bike in the bike shops. Now there's an export opportunity for Danish and Dutch brands. They have the style, now they need the bikes to match it. Riga Cycle Chic pour hommes. Riga locals are correct and true. I should say that this is a common issue in post-Soviet area. Many people want to ride bicycles, they love it and they start doing this, - but they can`t get normal bikes. I mean simple & elegant city bikes. In many areas people choose mountain ones due to the poor quality of roads & just fashion. 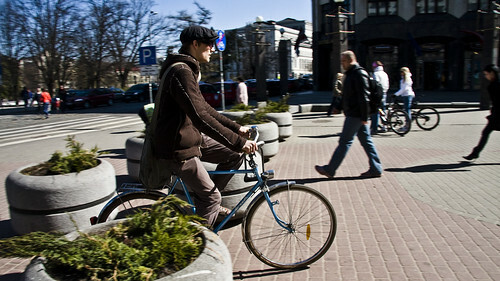 I remember from living in the Baltics that they are very fashionably inclined, and I'm sure the types of bikes often found in Dutch and Danish cities would do well there. I don't remember the road conditions in Vilnius being much worse than in Portland (except maybe for more cobblestones), and those types of bikes do just fine here. You'd just want to make sure you had good wheels. Much easier to export to the baltics too (as opposed to the U.S.), especially now that they're part of the EU.